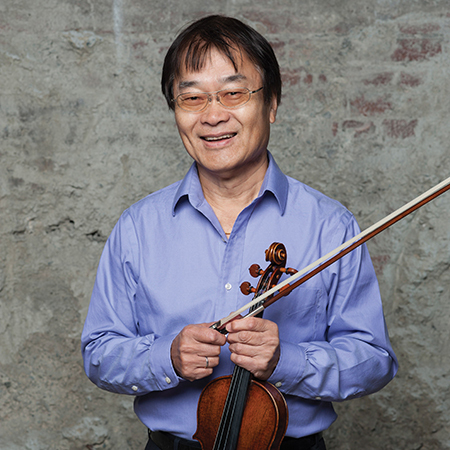 Associate Concertmaster Emeritus of Vancouver Symphony Orchestra, Akira Nagai* left Japan in 1967 for advanced studies with the famed Josef Gingold at Indiana University School of Music under a Fulbright scholarship. He earned a Master degree of Music in 1971 and immediately joined the Montreal Symphony Orchestra and McGill Chamber Orchestra. In Vancouver, he has kept an active in chamber music, private teaching and frequent solo appearances with Vancouver Symphony Orchestra and a former member of CBC Vancouver Orchestra and a former faculty member of Vancouver Academy of Music. He has enjoyed playing on both sides of the Pacific Ocean last 25 years. In the 1982-83 season, Akira served as concertmaster of the Yomiuri Nihon Symphony Orchestra and the Sapporo Symphony in 1995-96. For the last 10 years, he has been playing in a piano quartet called Pacific North Ensemble which he formed in Sapporo. Akira has also made frequent appearances as a guest concertmaster of Tokyo Symphony, Yomiuri Nihon Symphony Orchestra, Sendai Philharmonic and Japan Virtuoso Symphony Orchestra which gathering concertmasters and principals from all over Japan. He and his wife, Seri have recently started playing a duo: violin and viola in Vancouver and Japan.